Blackrock Outdoors run outdoor activities and team building days in Somerset. 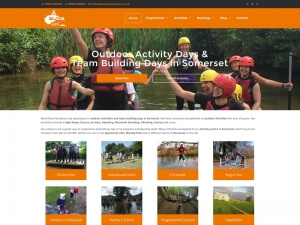 Having worked with Blaze Concepts for many years with their previous website the team at Blackrock Outdoors looked to Blaze again when it was time to refresh and modernise their site. We built the new website on the popular Content Management System (CMS), WordPress, as the client found the now outdated CMS a bit cumbersome and tricky to use. The team at Blackrock has found WordPress to be very flexible and easy to use, which has encouraged regular updates; great for SEO (Search Engine Optimisation). As well as the new design and CMS, the new website needed to provide a facility for clients of Blackrock to make online payments. A payment confirmation with payment reference number is sent via email to both the client and Blackrock. We developed this feature utilising the WordPress ecommerce plugin ‘WooCommerce’ along with some other plugins and some custom code to link it all together to provide this bespoke functionality in an economical solution. The final outcome of the new site is a modern, responsive website that Blackrock Outdoors are proud of and customers are finding informative and practical.